Bitfury, a developer of blockchain-based hardware and software products, has announced a new initiative: Bitfury Surround. 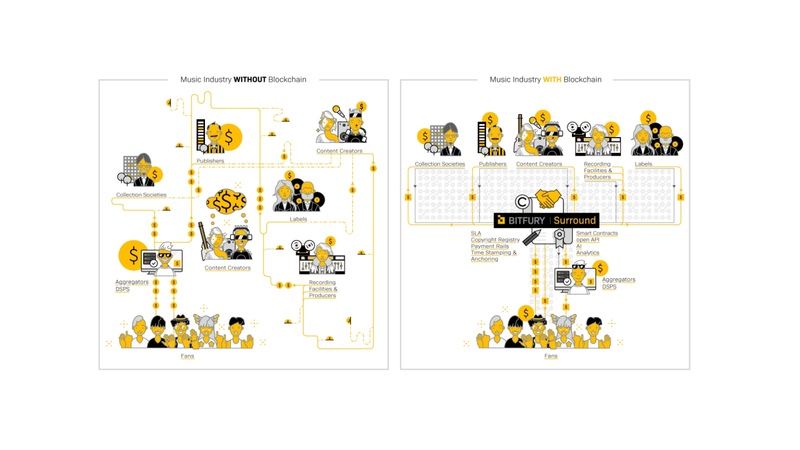 The project aims to build an open-source platform that streamlines operations in the music entertainment industry. Bitfury announced Bitfury Surround in a press release describing the platform as a tool that enables "secure transfer of copyright assets, streamlined connectivity [and] better monitoring and management systems" for the music industry. The release identified several specific functions that Surround will support or help to facilitate, including payment processing, licensing and auditability. Bitfury said that Surround will run on Exonum, a blockchain platform that Bitfury develops. Exonum makes it possible to run private or permissioned blockchains that only certain parties can access, while still registering certain data on a public blockchain (specifically, the Bitcoin blockchain). The release doesn't go into more detail than this about how, exactly, Surround will work. We can therefore only speculate about which specific features it will include and how they will function; however, it seems likely that Bitfury envisions a solution that will do things such as enable people who produce or own music to register their rights on the blockchain, make it possible to buy and sell music on the blockchain and track the location and licensing status of music through a blockchain-based registry. Because Exonum is part of the equation, we can also speculate that Bitfury plans to let stakeholders set up permissioned blockchains for completing the types of operations described above, while at the same time integrating some of the data with the Bitcoin blockchain for greater reliability. If you follow news about blockchain technology in the music industry, you know that there are a plethora of other projects, such as Mycelia and VOISE, that promise to use blockchain technology in order to make it safer, fairer or more efficient to store, share, license, monetize or access music. What makes Bitfury Surround different from these platforms? While it's hard to say at this point given the lack of detail about how the platform works or which specific features it includes, it seems likely that the answer is "not much." Perhaps Surround's only major distinguishing feature is its Exonum-based support for integrating permissioned blockchain data with Bitcoin. Whether that is enough to enable a killer feature that allows Surround to compete in a crowded space remains to be seen. But maybe competing aggressively in the music entertainment industry is not Bitfury's main goal here. The company could simply be seeking to build a use case for its Exonum blockchain. Bitfury's other products, which include devices for blockchain mining and payment solutions, have nothing to do with music. The company could instead seek to use Surround to demonstrate how Exonum can be used to create a real-world solution, in the hope that the platform will spur further interest in Exonum's unusual public-private blockchain architecture. Header image via Bitfury press release.